Iprotek's Web Application based on Java & Google Maps Enterprise gives a fully equipped command center to our users. Apart from showing the location and track, it has loads of other features like Geofence, My places, Groups and lots more. The Application also provides all settings and configuration options for the tracking device fitted in your vehicle. Theft Vehicle theft is the biggest threat to a fleet owner. In India, over 2 lakh vehicles get stolen every year as against the recovery rate of meagre 25%. It takes significant amount of time to recover lost vehicles and also there are chances of significant damage to the vehicle. Equipments or tools on board may be stolen too. Idling Excessive idling directly impacts the Kilometres per litre (KPL) ratio and ultimately adds up the cost of doing business. According to research, the fuel usage can be reduced up to 15% if idling is controlled. Redundant idling can also damage engine components including cylinders, spark plugs and exhaust systems apart from fuel wastage. Dispatching Lack of knowledge about the real location of a vehicle, dispatchers may not be able to send the closest vehicle to a job site or even give direct routing information. This can lead to considerable cost leakage. Calling up drivers to gain location and job status increases the amount of wasted time and cost. Over-speeding Speeding vehicles above apt limits tends to increase consumption of fuel for every Kilometre travelled which on the contrary has an adverse impact on the fuel efficiency. Moreover, driving at excessive speed adds to the risk of meeting with an accident on account of which the vehicle safety is endangered. Unauthorized Usage Using company vehicle for personal reasons during business hours also adds up the fuel usage and so the cost. Lack of technology makes it impossible to keep an account of route deviations and unauthorised stoppages. Apart from this, it would be burdensome to prevent fleet usage during non-business hours. Iprotek Tracking Platform is a comprehensive web application which is equipped with the features from Monitoring to Maintenance , and just about everything your car or fleet needs. Fleet managers using GPS based Fleet Management System for tracking their vehicles have benefitted in terms of quick Return On Investment (ROI) essentially due to considerable cost savings achieved through ideal utilization of available resources. Increased Fuel Efficiency Fleet managers can keep a track of idle time and over speeding of the vehicle i.e. vehicles exceeding a pre-set threshold. Then there can be comparison of idle time and the amount of fuel consumed between equivalently operated vehicles. Apart from that, monitoring Kilometres per Litre (KPL) averages of vehicle can reflect how implementation of vehicle tracking solution deter speeding and idling. Installing vehicle trackers boosts drivers to be more answerable and to practice safer driving habits. Once the employees are aware that their driving, speed and gas mileage are being tracked and monitored, greater care of the company vehicle usage will be taken. This enhanced behaviour will save fuel, reduce unsafe driving and amplify company's reputation. 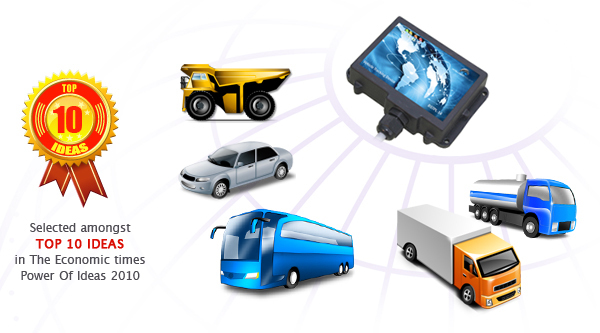 Dispatching and Routing Efficiency GPS fleet tracking gives a concrete benefit through optimum dispatching. Dispatchers can expedite the dispatching of vehicles that is closest to any job site once they know the accurate location of its company vehicles. This helps in saving fuel, reducing phone calls to drivers on the field and more importantly increment in customer satisfaction on account of enhanced response times. This also positively helps in improving routing efficiencies. Continuous tracking of vehicles enables to take the shortest route to any job site. Furthermore, this also helps in taking the correct route if the driver forgets the route. Also, more jobs get completed each day due to increased productivity of moving assets. Unauthorized Usage of Vehicles and Recovery in case of Theft GPS tracking provides accurate data on when an employee turns ON/OFF a vehicle, and arrival/ departure of a vehicle from a job site. Fleet owners will have complete knowledge of how long the employee worked at the job site. Also, reports generated by the tracking software help assist the fleet managers in verification of daily route, stoppages as well as inspect odd hours of usage, such as weekends. Ability to pinpoint any unauthorized usage is an add-on benefit of GPS tracking. Business owners will know unauthorised usage of their vehicle using this tracking solution. Vehicle's exact location can be retrieved using the GPS tracking unit in case of theft. This optimises retrieval times of the vehicles and also reduces the amount of damage caused to the vehicle while stolen. Other Effective Uses of GPS based Fleet Management System GPS vehicle tracking provides huge amount of additional data that can achieve further benefits. A GPS tracking solution assists in revising company driver policy. Policy should include guidelines for speed, idling and how to prevent any unauthorised usage which directly eliminates wasteful driving habits. A dependable GPS tracking solution provides user friendly reports to help fleet managers take business decisions based on data. With accurate information in hand, owners can identify whether drivers are following driving guidelines and if not then they might need additional counselling. Fleet owners also find the data gathered using GPS tracking unit as a technique to implement an explicit bonus program. According to the information received from the GPS system, drivers who follow appropriate driving procedures are entitled to bonuses. Companies can provide bonuses while still increasing the revenue since driving behaviour directly affects fleet costs. TechnPurple's inhouse R&D team and partners from abroad constantly develop innovative, inexpensive hardware devices and sensors. An experienced team of software developers integrate these hardware with Iprotek's Tracking Platform to give you some aamzing applications which can transform your business to eliminate gaps and generate profits. Trips One of country's biggest infrastructure with projects in India and abroad use Iprotek's Tracking Solution not just for tracking. Tippers carrying concrete mix, Dumpers and other construction site vehicles are fitted with trackers. The software apart from tracking is designed to for Counting Trips, Alerts in case of Route Deviation, Unexpected Halts or Excessive Idling. Reports are compiled and sent automatically to the concerned managers and their seniors. Information System State Transport Buses and School Buses Iprotek's Tracking Software for announcing estimated time of arrival. Other important information like distance and speed help them to generated traffic patterns and route usage. Critical data in passenger and children transport is overspeeding for which alerts are configured. Proximity Point of Interests The idea was primarily developed for Fleet Taxi. Along with billing, Cab Assignment and Passenger Pick-up module was also integrated with a tablet placed in Fleet Cab. A novel idea was advertising slots as the vehicle passed through an area. Malls, Shopping Plaza and Retail outlets can advertise or inform passenger about products and offers as the cab approaches their outlets.